Let’s make some pizza. I’ve searched all over the internet to get a really good recipe for the pizza dough. After trying several, i finally found the one i really liked. It’s from a recipe for the real pizza from Napels. Now put all of your water in your mixer bowl together with 10% of your flour and yeast. You start mixing on low to medium speed until all of the dry ingredients are dissolved in the water. Once it’s dissolved you add your yeast en also little by little the rest of the flour. When all of the flour is added, you keep mixing for about 20 minutes. Once you’ve mixed it for 20 minutes, it’s time to let the dough rise. Also you’ll notice that the dough is a bit wet, that is normal. I put the dough in the oven for 2 to 3 hours. Keep in mind that the oven needs to be in the off mode. When the dough has risen enough you’ll need to divide it in to 4 parts (the amount of pizza’s you want to make). Roll them to the thickness you like and start topping them. So what do i use for topping? I just take some passata and mozzarella cheese. 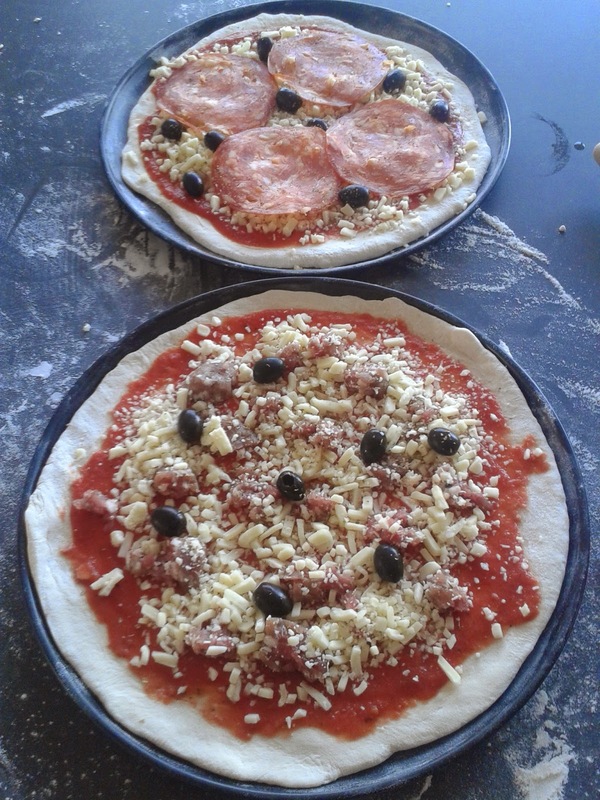 You can add all sorts of other stuff you want like: salsiccia, salame, ham, all sorts of cheese, artichok, olives, … Don’t overfill your pizza, remember, less is more. I usually just do 1 topping besides the passata and mozzarella, and maybe some olives. You can also add some dried chilly flakes or some garlic to spice it all up. Once the pizza is topped you’ll need to put it in the oven. Remember, the hotter, the better. 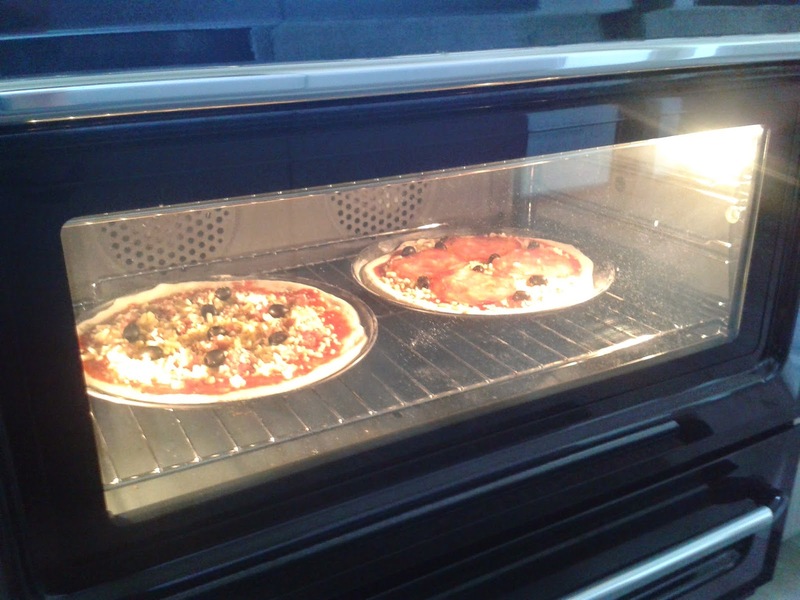 My oven goes up to 260°C (500°F) and will need about 10 minutes. Keep in mind that the hotter you go, the faster the pizza is ready. 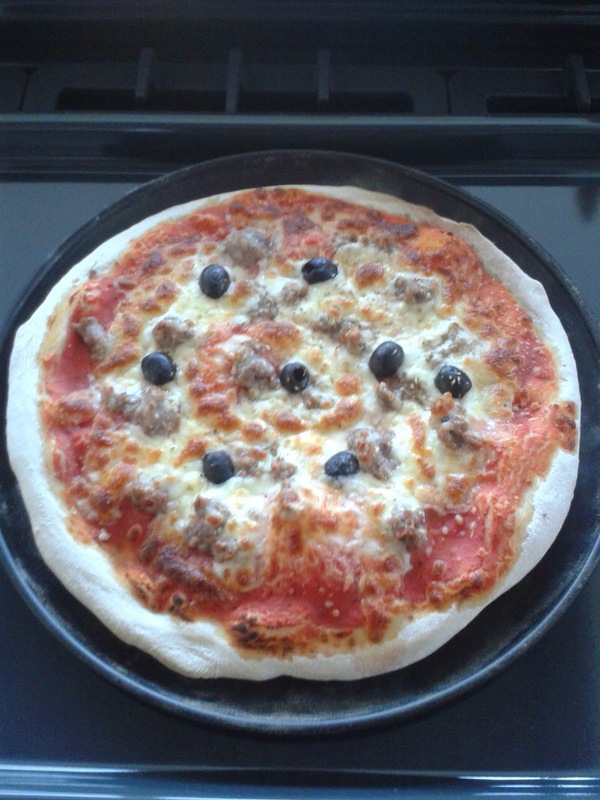 Now the pizza is ready to eat! Enjoy!